Home » Dyslexia » How do you get dyslexia? See how dyslexia is given to kids before the 4th grade! Logical Learners →Poor Spellers: Logical learners like, Albert Einstein who could not spell, are born with a brain that is wired to question the logic behind anything they are about to memorize; and they cannot memorize anything that does not make sense. Their learning style is a logical learning style; they are so logical, they expect to see “My cat is cute.” to be “Mi kat iz qut.” If they do not see the logic behind something, they cannot memorize it; and, there is nothing wrong with the way logical learners think or learn. In fact, they are the most coherent and rational thinkers; they simply cannot see the logic in the way English words are spelled. The reason most people can read but cannot always remember the spelling of the words that they read is that one English sound can be spelled in many different ways. Typically, logical learners are the ones who ask for spelling rules to know when to spell an English sound one-way and not the other. If no spelling rules are provided, logical learners simply cannot memorize the spelling of English words and some of them cannot read at all. Logical children who only know the ABC’s are usually shocked when a great number of sentences like “My cat is cute.” are randomly thrown at them to read without any logical structure (whole language), and they wonder WHY they were told one thing when they were learning their ABC’s and then expected to read or write another. It is this big WHY that makes a huge difference between the two types of learners, who are born with two different wiring systems in their brains. It is because of this big WHY that logical learners (analyzers) fall behind in class while memorizers are reading at a faster pace. Because they are so young, logical kids cannot form all the complex questions they need to ask; and, the number of whys overwhelms them at such a young age. Because they are so young, logical children cannot form all the complex questions they wish to ask; and, the number of whys overwhelms them at such a young age. They may wish to ask their teachers why the “q” sound is spelled with a “cu,” why the “i” sound is spelled with a “y,” why the “z” sound is spelled with an “s,” and why the “k” sound is spelled with a “c”; but they cannot form such complex linguistic questions. Eventually, they become too overwhelmed with the number of questions they wish to ask, and then they decide to keep their mouths shut and put the blame upon themselves. As a result, logical children continue to fall behind in class, and no one realizes why they are falling behind. No one else around them knows what they have been through; even they, themselves, lose track of what is taking place. This entire episode happens so fast; it is like a quick nightmare that one forgets its details after waking up. Shortly after that, the commotion created around them and the worried parents lead these poor kids to believe they have some type of an innate learning problem. Before they know it, the testing specialists come to schools to diagnose them as dyslexics and / or learning disabled. Their only fault is that they are too intelligent to accept the illogical way we spell English words. Their condition remains a mystery to them, to their teachers, to their parents, and even to the specialists who may have a PhD in dyslexia diagnostic. According to reliable statistics, 2 out of 3 people are logical learners. It is an outrage to watch our nation’s finest type of thinkers being forced to live with dyslexia and falling behind in class. Since when was questioning, analyzing, and logical thinking a defect? Their only fault is that they are too intelligent to accept the illogical way we spell English words. In time, these poor kids fall behind, not only in reading and spelling but also in all other subjects that require reading and spelling. This is one of the reasons that so many dyslexic persons are creative in performing arts, which do not require as much reading or spelling. 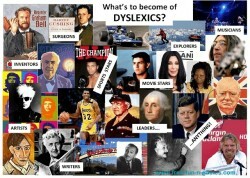 Type “Celebrities with Dyslexia” in search engines and you will need hours to read the long list. Consequently, logical learners (analyzers) become aware of the need to hurry, and they read faster to keep up with their classmates who are memorizers. They feel the pressure of having to read faster coming from their school, their peers, their parents, and from society. They are told to try harder and traditional educators and other literacy advocates advise these kids to speed-read, and to read more interesting stories to improve their spelling skills. Traditional educators have no idea that these kids cannot focus on two things at a time; namely, they cannot focus simultaneously on the way words are spelled, while reading for comprehension to find the main idea. Traditional educators continue to ask logical kids to read more stories when these poor kids cannot yet read or spell words or certain sounds in words. Nevertheless, kids continue to try harder to read as they are told. In the midst of all this pressure, they develop the ability to speed-read before learning to spell or read words. Eventually, they speed-read without seeing the way words are spelled and they do not have the time to see and differentiate words like (niece & nice), (nose & noise) or (exit & exist). They are highly focused on the main idea and they don’t have the time needed to look or see the details inside the words they are reading. They hurry so much that their vision travels rapidly from left-to-right and from right-to-left. In their haste, they end up seeing letters and sometimes words in reverse. When they write, they hurry and write letters in reverse, in that same reversed manner they saw them. They are in a desperate need to read slowly in order to see the way words are written. Yet, they feel forced to speed-read, and speed-reading only worsens their situation. Speed in reading or in anything is a result of a process that one can only achieve naturally; speed cannot be achieved through force. We cannot force babies to run before they can crawl or walk. Poor Spelling →Dyslexia: Constantly, logical persons labeled with dyslexia think they have to hurry, and then they become obsessed with hurrying. 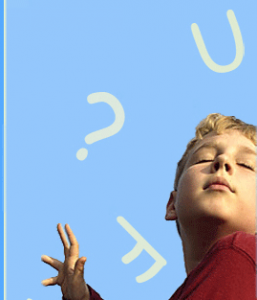 If dyslexia is a disorder, it is an acquired hurrying disorder that can be reversed. Even when asked to look at words and copy them, they hurry and may copy letters in reverse. They hurry more when asked to find the main idea in the story or when asked to pay attention to punctuation or grammar. Logical learners (analyzers) can only focus on one thing at a time; hence, they focus highly on the main idea but not on the way, words are spelled. And this is the story of how dyslexia is given to kids before the 3rd grade. The learning style of dyslexic persons like Albert Einstein is a logical learning style; they need logical spelling rules or they will have spelling difficulties. Forced speed-reading before learning to spell words, causes persons with spelling difficulties to see letters in reverse, and eventually writing letters in reverse. Dyslexia in writing letters in reverse is caused by forced speed-reading before learning to spell words. When no logical spelling rules are provided, logical learners are the ones who get dyslexia in spelling and in writing letters in reverse. Usually, dyslexia is given to kids before the 3rd grade. For six years, Lee couldn’t read and was branded with dyslexia, ADD, learning disability, etc. Not only did Lee learn but also he learned in a week. Because he learned so quickly, Lee proved that he was NOT learning disabled and his dyslexia was reversed. His school never did understand how he learned when prior to that he was sitting in class for six years unable to read. After Lee learned to spell, his teacher Mr. Woods expressed, “Lee seems to be calculating something before he can spell words, and I don’t care how he gets them as long as he keeps spelling them right.” See Lee’s writing before and after Lee Learned to Read in a Week!